Ngaa mihi ki a koutou e te whanau o Te Kura a Rohe o Whaingaroa. We would like to acknowledge the appointment of our new Principal Louisa Barham. She will be meeting with all staff over the coming weeks. Congratulations to all our sports awards recipients at last Friday (2 November) evenings ceremony. This was a well run and well attended event. 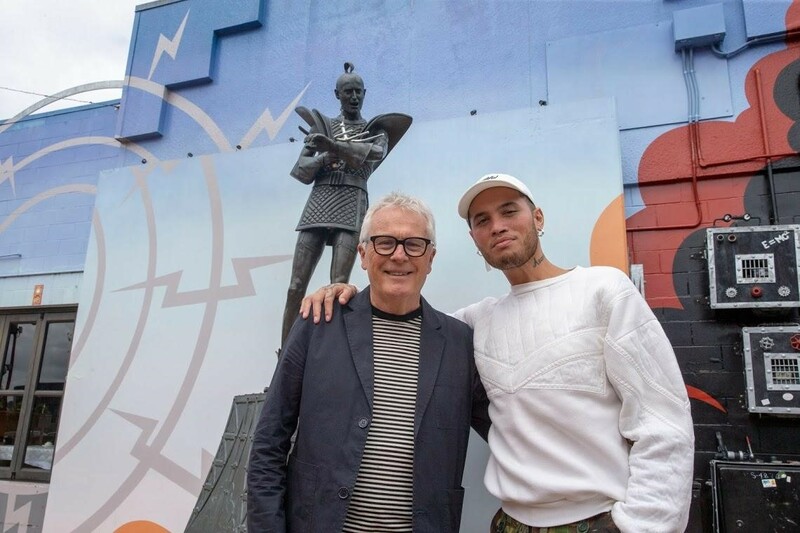 Our appreciation goes out to all those who helped to make this event a success. We would also like to acknowledge the generous sponsorship of the Raglan Lions. This week exams begin for all our senior students (Yr 11-13). 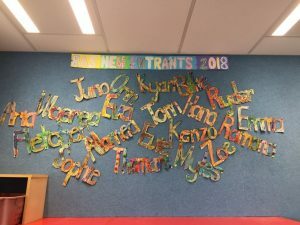 They have wananga (exam prep with their key teacher) over the following weeks and can also begin signing out. These next weeks are crucial and staff are available for support. This Friday (9 November), 6 pm is the senior prize-giving, followed by our Year 13 graduation dinner at 8pm at Orca. Friday 23 November we have a half day Teacher Only Teacher. School will close at 12pm. Exams will run as normal. Currently we are doing a whole school diagnostic assessment with Ian Hunter and his team through Write that Essay. This continues from the professional development our staff attended in Term 2. Write that Essay’s Composite Skills Index (CSI) is a scientific writing diagnostic test which identifies key areas of writing strengths and weaknesses across our kura. 150 students from Year 4-13 are part of this process. We will use this data to inform practice for 2019. RAS Junior Athletics is on next Friday 16 November, 9.30am kick off and will run all day. This is for our 8 year olds to 13 year olds. All whānau welcome to come and support our moko. Reminder we have a half day on Friday 23 November due to PLD for staff with Dr.Welby Ings. Later that night we have a community evening with Dr.Welby Ings from 6.30pm-8pm. All are welcome. 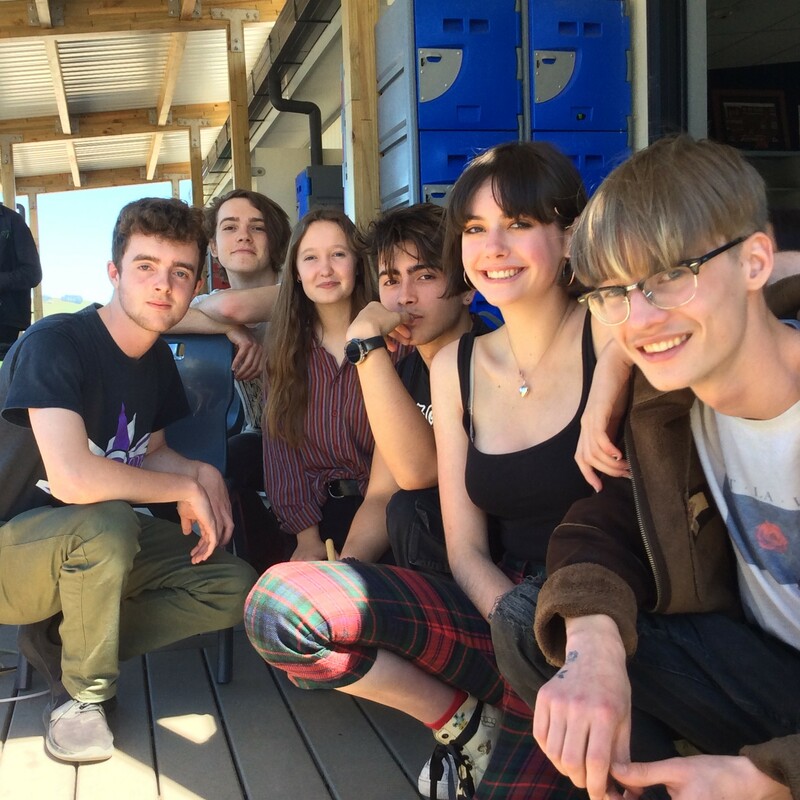 The mobile dental clinic will be back at Raglan Area School, in the car park beside the school hall, from Monday 19 November through to term 1 2019. 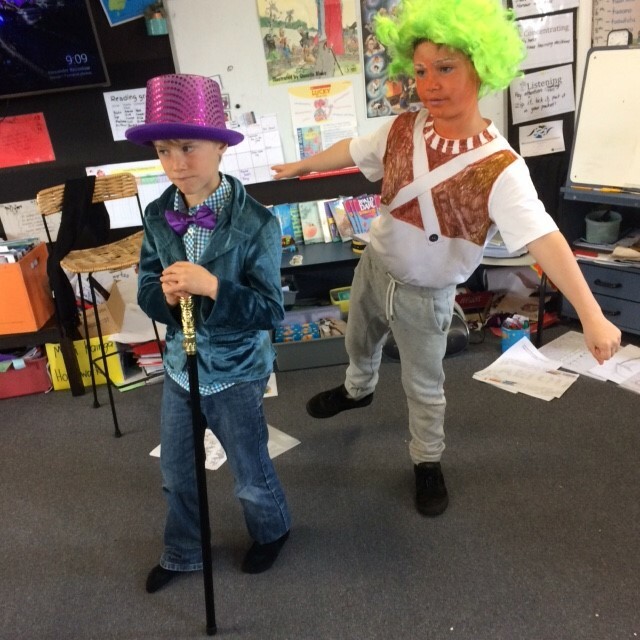 RAS PTA First Fundraising Events Underway – Please Support Us! 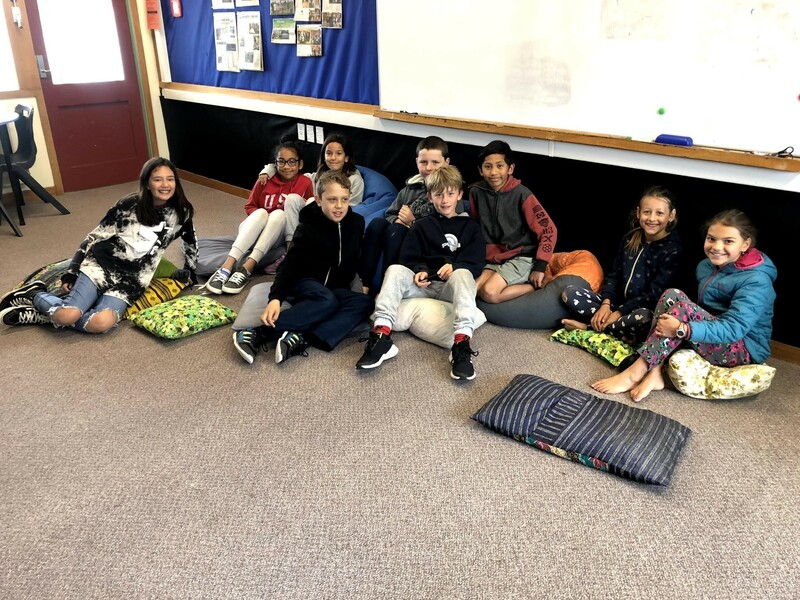 Fundraising by our RAS PTA group is underway after getting approval for our first few events from one of our Acting Principals, Aroha Hohepa. 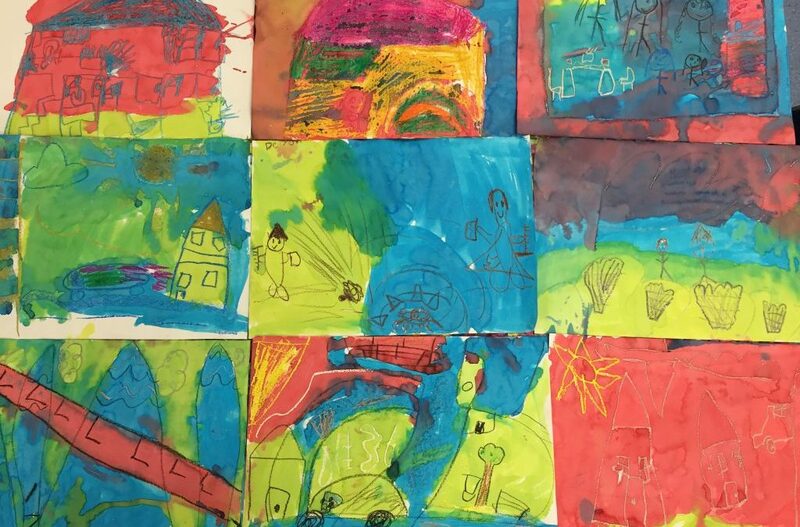 All money raised through PTA activities will go into our PTA fund and be saved for school projects in 2019. Money will be donated by the PTA to; school trips/camps, equipment for classes, school building projects, sports equipment and many other areas where it is needed. The prioritisation of where the money goes will be decided along with the new Principal but rest assured this will be targeted to meet the needs of our children. We’ll use parent, staff and student voice, with guidance from our principal to place the funds effectively. Each term we will report to parents/students on how much money was raised and what it was spent on. So here are some details on our first projects. We’d love your support. RAS Cricket Gala – Friday 23rd November, 9.30am to 2pm – we’re going to set up a couple of stalls and offer yummy food/other items for sale on this day. Meat or Vege nachos, Dizzy Blocks, baking and popcorn. We need donations of either cash to buy ingredients or ingredients for baking. We’ll also have some great Christmas pressie options available from the Real Good Fundraising people; Seed bombs, Soaps, Reusable Cups and Reusable food pouches. An eftpos machine will be available on the day. There’s a Half Teacher Only Day on this day but please bring your kids by when you pick them up to check out our stall for lunch. We’ll be open from 10.30am to 2pm. Wellby Ings Talk – Friday 23rd November, 6pm to 9pm – we’ll have a stall in the foyer of the gym to raise awareness of the PTA and try to drum up some more help from volunteers! 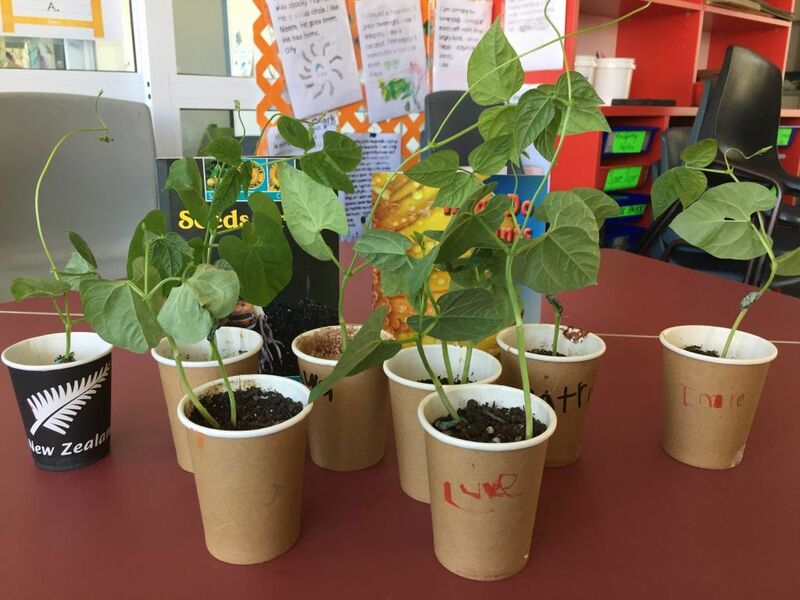 Real Good Fundraising – www.realgoodfundraising.co.nz – we came across these eco-friendly fundraising products and thought this would be perfect for our school. Hoping to have some of these products available for sale in the lead up to Christmas. First Aid Training Workshop– Wednesday 21st November – 6:00pm to 8:00pm. Come along and learn CPR and the basics of what to do in an emergency. The Workshop is being run by qualified First Aid and Emergency Response Trainer Nenya Chapman. Cost $40. Contact Cam at 021529765 to book a spot. Limited to a max of 12 participants. Please note this is not a fully certified first aid course. First aid kits will be available for sale so please bring some cash. We’d love some help or support, please let us know how you can help us. 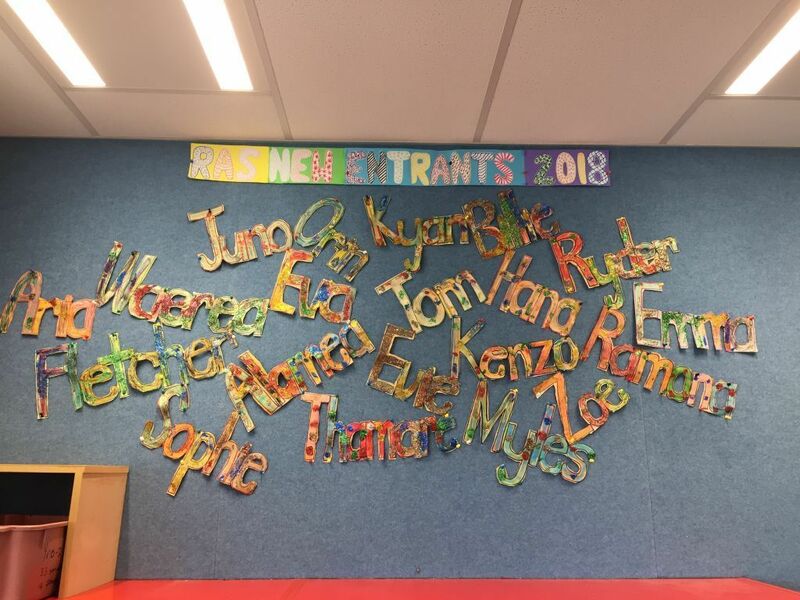 Contact Inger Kite 0272672775 or TJ Pemberton on 02102592405 or email: pta@raglanarea.school.nz . Our next PTA meeting is at 6pm on Monday 19 November at the RAS staffroom. Everyone is welcome. Ideas on how you can help us: Time (Volunteering); Ingredients (For baking); Donations (Bank account- Raglan Area School PTA 38 9020 0009572 00). Link hands with a safe person and WALK quickly across the road, still looking as you go. 23 November All School Half day Teacher Only Day – PLD with Welby Ings. There will be an evening session from 6.30pm—8.00pm All welcome, nau mai, haere mai. Host a day where RAS students can compete for a representative role in the RAS team at Western Cluster Athletics. Volleyball – Our Year 9/10 Volleyball team secured a big win last Thursday night – way to go team. 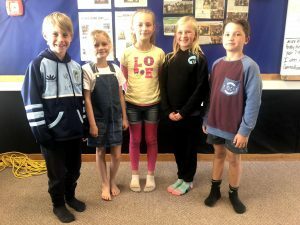 Touch Rugby – Our junior school Touch Rugby teams, the Raptors and the Rays have played two games in the Friday night competition now and are making huge gains every game. Miniball – We have Miniball running on Monday nights from 3.30pm to 5.00pm in the school gym for years 1 – 4. No registration needed, just come on down and give it a go. Gold coin koha. School Athletics – for our Year 4 to year 8 students, this will be on Friday 16th November. Hopefully you can come on down and cheer our students on. Cricket Gala – This is on Friday 23rd November at RAS. Hamilton Cricket will be running the day and we have three Year 5/6 teams and one Year 7/8 team competing. The four D classes are doing gymnastics in the hall on Monday and Tuesday from 2 pm – 3 pm and on Friday from 9 am to 10 am. Here is Kelsie swinging on the bar and the rest of her group waiting patiently. 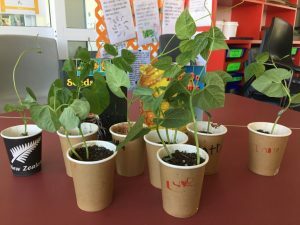 D1 have been growing great beans! D3 made some crayon and dye pictures of their holiday fun. 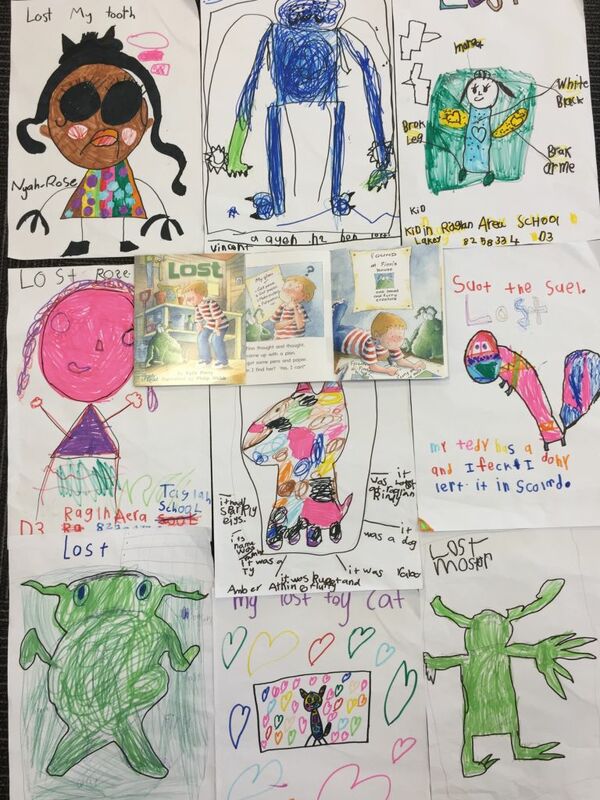 For shared reading, D3 enjoyed a story called Lost where a boy finds a monster and makes a found poster to display. 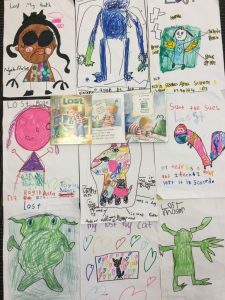 We talked and wrote about things we have lost or found and made our own posters. 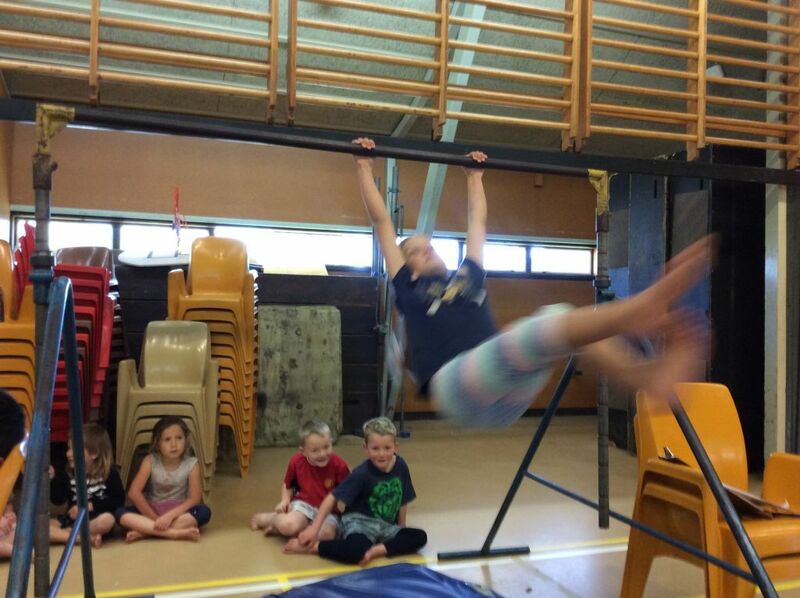 In Week 1 of Term 4, Year 2-4 students started to do gymnastics in the school hall. There were vaults, beams, ropes and bars that they could go on. Most students were annoyed that there was no trampoline, and I was annoyed too. 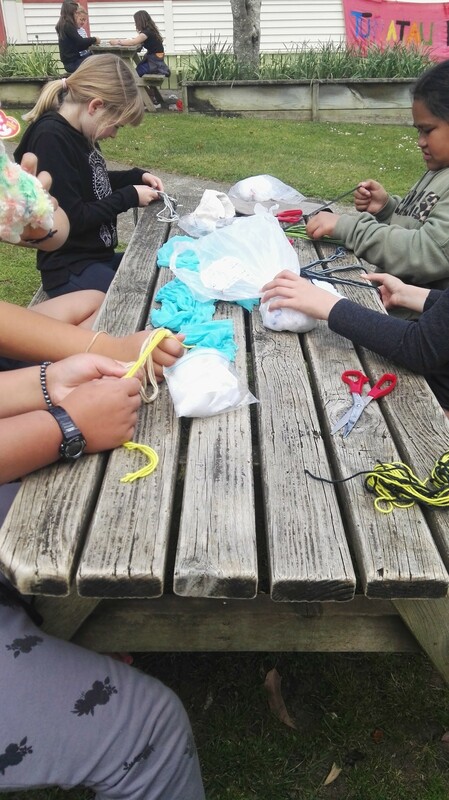 Year 5/6 girls are learning the poi this term…but first we have to make them!! On Tuesday of Week 1, Sasha Kirkwood (Y11), Emily Wiki (Y12) and Nick Keys (in support) participated in a singing-songwriting workshop with Stan Walker and Mike Chung in Hamilton. 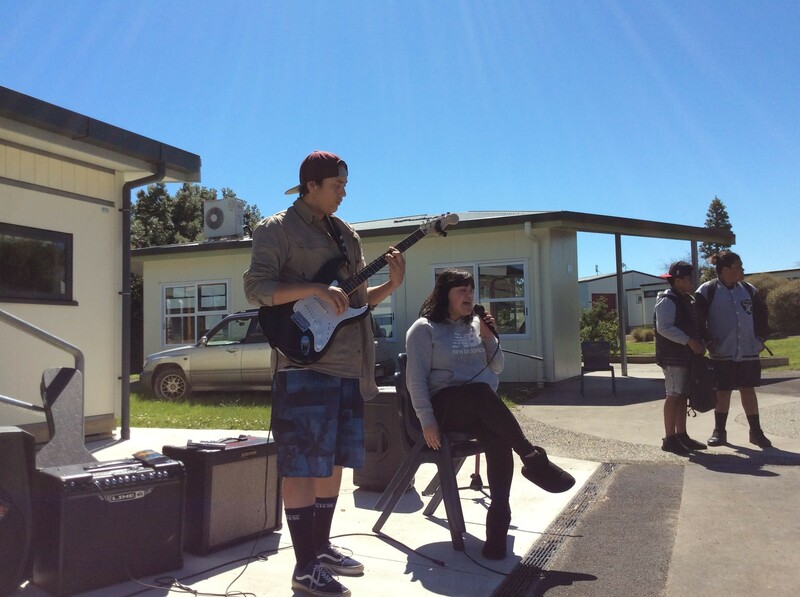 Around 250 students from schools all over the Waikato took part singing Stan’s song ‘Aotearoa’. With a four-part harmony and six soloists, students performed the song convincingly and with beautiful choir-like sound. 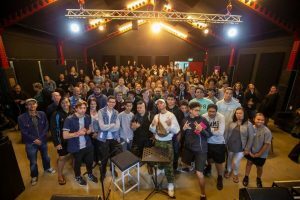 Mike Chung from ‘Play it Strange’ gave a short speech on the importance of writing original music, and having this in our music curriculum. Be sure to catch these two – up and coming – musicians around town. 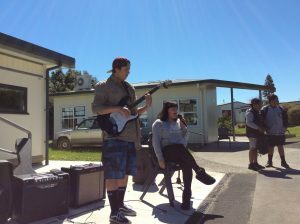 On Friday afternoon, Waiheke High School played a concert. Editor’s Note: This is the first article written by Year 0-2 Junior Media Crew students. These students took photographs, some of which you see here (others are included in our digital newsletter). They also filmed and edited the footage into montages, which are also available in our digital newsletter. 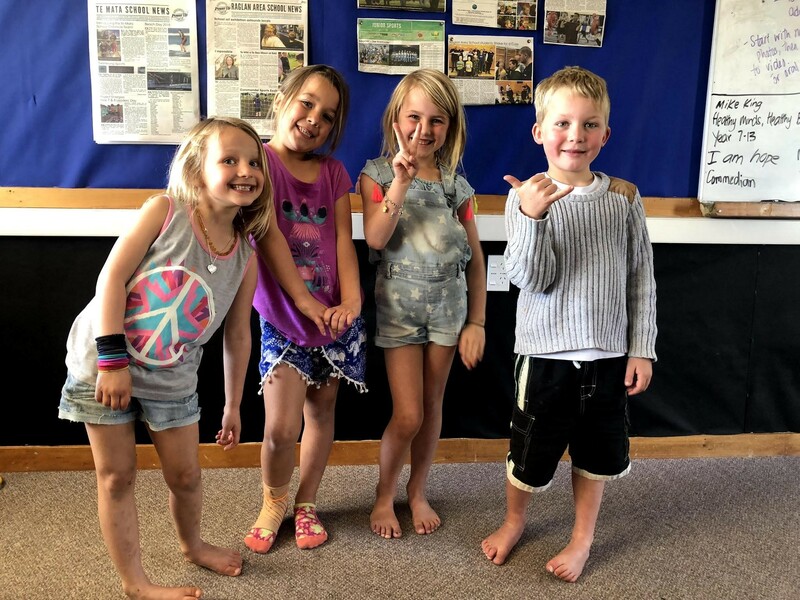 We are so excited to introduce our new Junior Media Crew members from the Year 0-6 syndicate! These teams will supplement the awesome work that the Senior Media Crew (Year 7/8 students) have been doing for the last two terms.